In addition to the classic monuments and locations of interest on the city, on this excursion, we will focus on the modern dimension of Aarhus: we will visit the art museum and discover the city as never seen before. Clue: it involves a rainbow. We meet our local guide immediately and set off for a tour of Aahrus, the second largest city in Denmark and we visit all the main points of interest. We begin with the magnificent City Hall: designed by Arne Jacobson and Erik Møller, icons of Danish design, and a classic example of functionalist architecture. The excursion will enable us to appreciate the large university area, the charming seafront and the city centre. We will proceed to one of the best and largest modern art museums in Europe. ARoS, Aarhus Art Museum. In the entrance, the museum welcomes us with the most popular specialist exhibitions and the "9 spaces" in which the installations are presented. We climb to the upper floors where we discover the collections belonging to the museum, which focus on the period from the 19th century to the present day. If we are hungry at this stage, on the top floor we will also find a restaurant. Finally we reach the roof and enjoy an incredible view of the entire city of Aahrus... in colour! 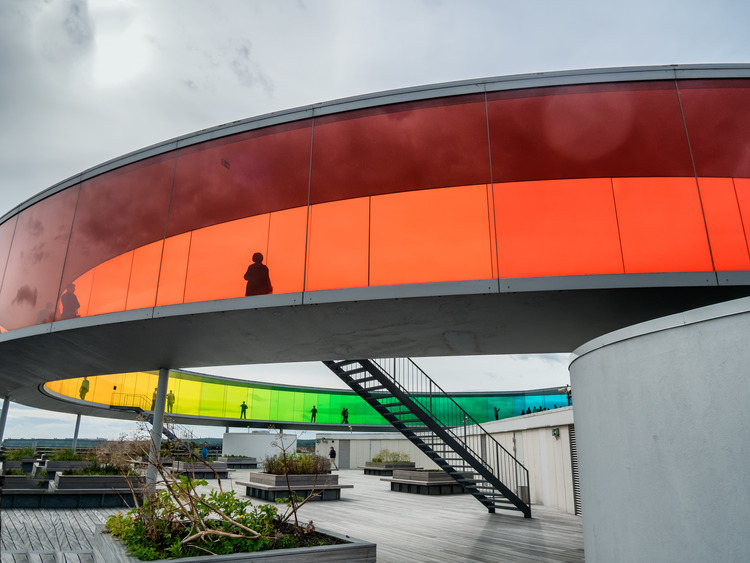 The work "Your rainbow panorama" has been installed on the roof: a circular skywalk whose windows are the colours of the rainbow, showing a different perspective of the city according to our position.